It’s hard to imagine now that the Glock 17, at its time of the release, was considered a premium option for concealed carrying by the general gun public. While this is still the case, the problem for the Glock 17 is that perceptions in the gun community have changed. An ever-increasing demand for smaller and smaller guns gave way to the Glock 19, a reduced-size version of the Glock 17, then the Glock 26, a version of the Glock 19 with a smaller frame, and now finally the Glock 43 – a smaller version of the Glock 26. Given that Glock has long been considered the world standard in handgun manufacturing – and for good reason – it has been a bit surprising that the Austrian gun company had not released a single stack, 9mm pistol. Although there had been other companies to have that category covered, Glock had not been one of them – that is, until the release of the highly anticipated Glock 43. Designed as a ‘slimline’ version of the subcompact Glock 26, a heralded and highly acclaimed gun in its own right, the Glock 43 features an ultra-compact slide and frame and is the first Glock handgun that uses a 9 x 19 parabellum magazine. The Glock 43 has a more limited range of magazines it can use due to the limited nature of it being a single stack 9mm, but this is made up for thanks in large part to its smaller size and compact form. While magazine friendliness has been a selling point of Glock handguns, as everyone likes a gun that can accept all different kinds of ammo, this was a necessary sacrifice in order to release what is perhaps the ideal concealed carry handgun in the 43. 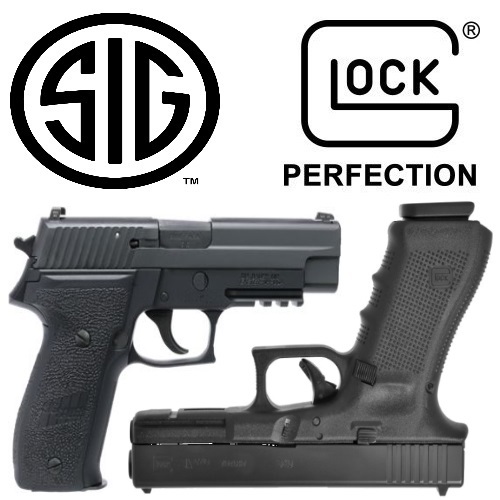 All in all, you would think that in order to produce a smaller, sleeker handgun, Glock would need to compromise on many of the qualities that make Glock guns so special, but this is certainly not the case. The Glock 43 packs some serious punch and just gets the job done, as we will detail here in our Glock 43 Review 2016! Length – 159 mm / 6.26 in. Height – 108 mm / 4.25 in. Width – 26 mm / 1.02 in. Length Between Sights – 132 mm / 5.20 in. Barrel Length – 86 mm / 3.39 in. Length of Twist – 250 mm / 9.84 in. The Glock 43 is, to put it simply, of a smaller size. Smaller than you’re used to when it comes to Glock guns, anyway – overall familiarity with the size of the gun will depend on the specific user. Glock tries to keep things familiar by keeping the trigger reach and pistol grip dimensionally equivalent to the larger 9×19 handguns produced by Glock, but there’s no mistaking it or getting around it – the Glock 43 is on the smaller side. The beaver tail design of the gun as well as the aggressive grip texture do help with handling and gripping the gun, as does the large magazine catch which allows for easy magazine removal. The Glock 43 is polymer based, as should come as no surprise to Glock lovers, and the gun feels like it could survive an atomic-bomb blast. 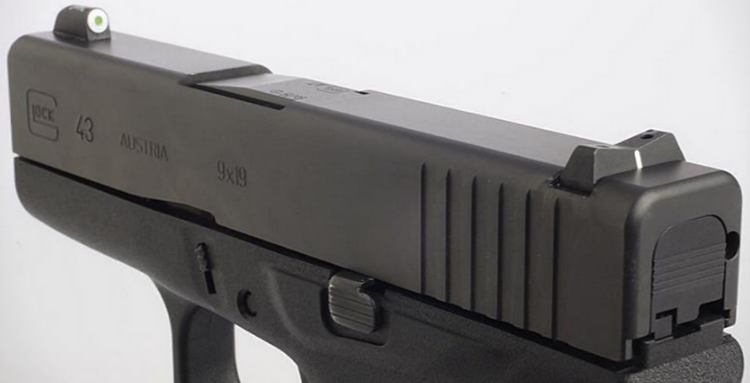 Basically, in typical Glock fashion, the gun is well- built, sturdy, and reliable. Given the fact that the Glock 43 by definition compromises on size and weight, it would be unfair to expect the gun to perform just as admirably when shooting as its high-quality predecessors in the Glock lineup. While the 43 unsurprisingly does not handle or shoot quite as well as the Glock 17, 19, or 26, it does a damn good job given its smaller frame and lessened weight. Depending on what you’re used to, be it double-stack pistols or single-stack subcompacts, the gun may or may not feel familiar in hand and perfectly natural. However, regardless of who you are or where you’ve been, you would be very hard pressed to find a handgun of this size that features this little kick or recoil, and handles as well as the Glock 43. 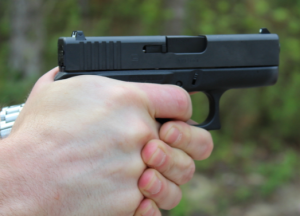 Handguns of this size are known for handling shakily and featuring a decent amount of recoil, but the superior build quality that Glock is known for wins out and the Glock 43 handles like a gun of a greater size and weight. 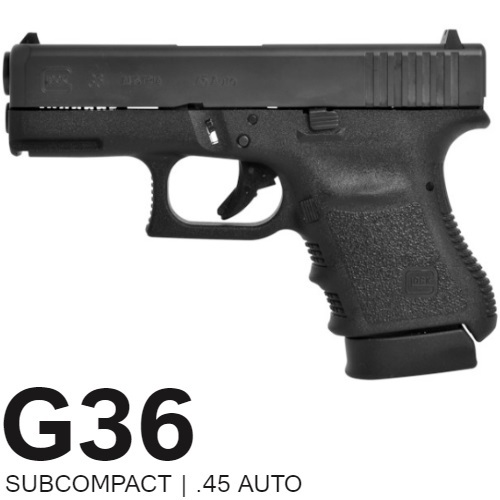 This makes for a more reliable and accurate shooting experience with the Glock 43. However, one area that Glock quality cannot overcome in this gun is the challenge typically associated with drawing a handgun of this size. The bottom line is, the smaller the firearm, the less area there is to grip the gun on the draw. The best way to overcome this is via the three p’s: practice, practice, and practice. A good, familiar, and reliable holster helps as well. The other area that the Glock 43 necessarily needs to compromise on in order to achieve its compact size is in its magazine. The Glock 43 comes equipped with a six-round magazine, as well as includes a spare, and don’t count on any of your old, reliable Glock ammunition being compatible with the 43 – it’s not, and it won’t be. This should come as no surprise, of course – realistically speaking, smaller ammunition might be compatible with a larger weapon, but larger ammunition is never going to work with a smaller weapon. The Glock 43 is a significant step down in terms of capacity from its older brothers in the Glock line – the Glock 17, which holds 17 rounds, and the Glock 19, which holds 15 rounds. Even a primary competitor of the Glock 43, the S&W Shield, holds a superior eight bullets. However, don’t be too hard on Glock about all of this. The Glock 43 aims to achieve one goal, and that is to become the ideal prototypical concealed carry weapon for self-defense minded gun owners. 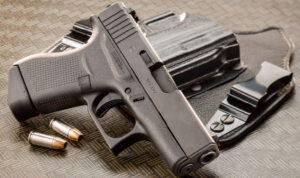 Until the very nature of ammunition changes in terms of size, coming equipped with a smaller magazine was always going to be a necessary compromise in terms of achieving this goal – Glock knew what needed to be done, and did it. This is in fact an area of concern that can be addressed with extended mags, but that’s an area we’ll get to shortly. If there’s one are that consistently draws mixed reviews in Glock handguns – and you’d be hard pressed to find any, Glock does produce really excellent firearms – it’s in the factory sights that come with the guns. The plastic and uninventive sights are an outlier in Glock’s otherwise standard-setting build designs, as the dot in box visual reference and underwhelming helpfulness don’t exactly make for standout features in Glock’s standout guns. This is the case once again in the Glock 43. The sights of the gun don’t exactly disappoint, as they do in fact ‘get the job done’ but they don’t exactly scream ‘world class Glock quality’ either. Like the Glock 43 magazines, this is an area that can be addressed via secondary market accessories and upgrades – but we’ll be getting to that shortly. There’s one reason that a gun owner would be interested in owning a handgun of this size, remarkably small-handed people notwithstanding. That reason is for concealed carry purposes – e.g., for the sake of personal safety and keeping yourself ready for any situation the world can throw at you in public settings. Suffice it to say that folks who own handguns for concealed carry purposes are usually concerned with the safety features and standards of the handguns they own as well – gun safety and personal safety kind of go hand-in-hand, wouldn’t you say? Well, luckily for these concealed carriers, the size of the Glock 43 does not impact the implementation of the patented Glock Safe Action safety system. 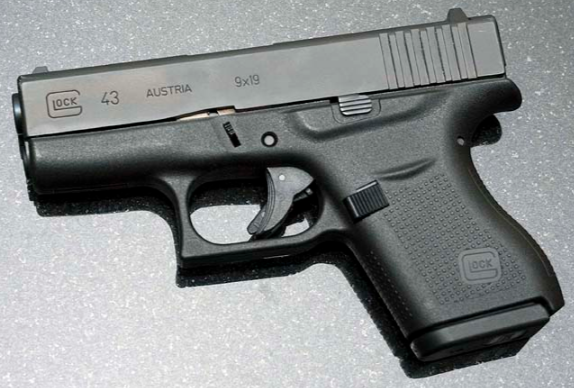 As is the case with the other Glock guns, the 43 uses Glock’s highly praised three-part automatic safety system. 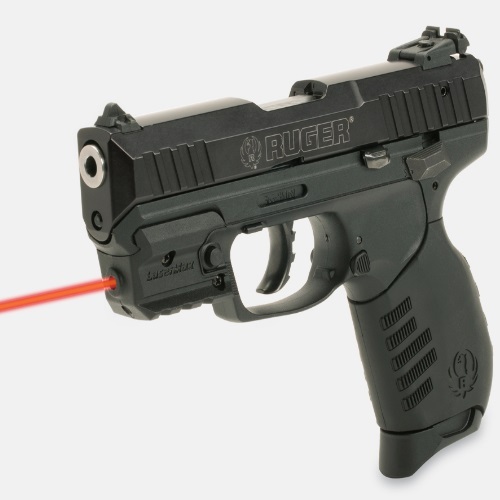 The trigger safety renders the trigger unusable unless engaged at the same time as the trigger, the firing pin safety blocks the firing pin from moving forward until the trigger is pulled, and the drop safety prevents unwanted firing due to drops or accidental impact. The bottom line is, any gun that benefits from the Glock safety system is sure to be safe as heck, and the 43 is no exception. Also as is the case with all Glock guns, the Glock 43 is a breeze to take apart for maintenance and cleaning purposes. Although it doesn’t offer quite as many accessories, modification, or customization options as some other firearms in the Glock family (although what guns do have as many accessories as the Glock 19 or 17? ), the Glock 43 has plenty of trinkets and toys for users to try out. For starters, it may be of interest to many to learn that there are in fact extended magazine options for 43 owners, boosting 1-3 rounds to the factory standard six bullet capacity of the 43 magazine. This may seem silly to some, as an extended magazine will add size to a gun whose selling point is its small form, but hey, gun owners can be weird. For gun owners dissatisfied with the sights of the gun, the 43 also has a number of first and third part options available in terms of different sights – night sights in particular are a great option for concealed-carry owners who could be traveling alone in questionable areas in the dark of knight. Laser sights are also a good option in terms of customization for the 43, increasing visibility where it may be necessary. Lastly, as is to be expected when it comes to a standout small-form, concealed carry gun, the Glock 43 offers a plethora of options when it comes to holsters. A near-necessity for a defense and concealed gun of this nature, gun owners can have a lot of fun testing and trying different holsters – try as many as you can until you find one that works best for you. 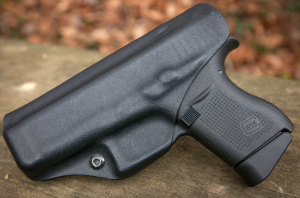 A comfortable, practical, and reliable holster will make for a safe Glock 43 experience. The bottom line is, Glock has become so good at making handguns that some stubborn customers might be annoyed at some of the necessary limitations of a gun as small as the 43, such as an increase in kick and a smaller magazine. However, when it comes to single stack, 9mm pistols, the Glock 43, while a latecomer to this category, is the standard of the gun industry. If you’re looking for a small-form, concealed carry handgun that is reliable, easily handled, and built well, look no further – the Glock 43 is assuredly the gun for you, the latest in Glock’s long legacy of handgun successes. Thanks for reading our Glock 43 feature – be sure to check back for more on Glock, as well as all things guns here at Gunivore!